The Arundale Mandarin is one of the best "squirrel-proof" solutions available today. Its majestic 17" dome is completely impenetrable to tampering seed-stealers, and with a massive 7 lb. capacity, you won't have to refill your feeder as often. Its dramatic dome also works great to shelter birds from rain and snow. 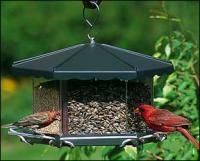 Easy to fill and clean, and features medium-length perches to discourage larger birds from setting up shop. 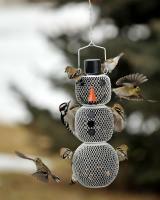 Great for chickadees, finches, cardinals, and woodpeckers. Able to be hung or pole mounted. Includes a lifetime warranty! The birds love it. They fight to get on the 4 perches. It has also deterred the squirrels of which I am exceedingly happy about.. I find this to be accepting to the birds.So far even a hairy woodpecker was able to land safely.No squirrel problems yet.I believe its to steep for them.Time will tell.The rim is great for protecting the seed outlet. Easy to fill. I love everything about this bird feeder! It has a clean neat appearance, large fill capacity, and it has easy to use feeding stations. The clever squirrels have not been able to figure out how to beat its squirrel proof design. Best bird feeder I ever bought. 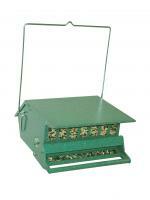 It is a great feeder, large capacity, and squirrel proof! I love it! I'm convinced it is the only squirrel proof feeder available. I have tried them all. I love my feeder and the birds do too. This is the best bird feeder ever! It's a great time watching the birds! It's hilarious watching the squirrels try and get some food too! This is the only feeder that could beat our squirrels. All the other, door, rotating, and grating could be solved by the squirrels. They tried on this one but failed always. The only problem may be the perch as they seem to be weak but no problems so far. This is our 2nd one. Our first is probably 6-7 years old and is the only feeder we know of that is 100% squirrel proof. I have owned this item before - it lasted for about 30 years. I wanted a new one. I was glad to be able to replace it! So far it works. We love the capacity of the container. This feeder is bigger then I expected. It holds a substantial amount of food. Assembly was easy but I was not happy about having to "glue" the top washer on for weather conditions. I was hoping it was going to be rain proof with the rubber washer it came with. I had to put extra glue on top of the hole where the chain fed through for hanging. 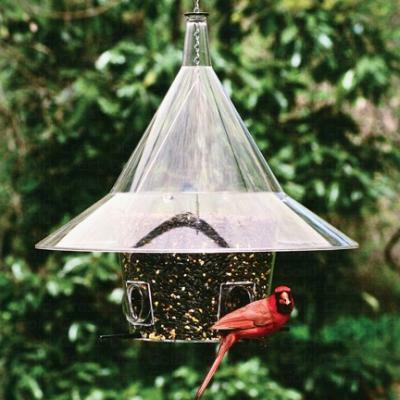 Other then that its a great bird feeder and easy to clean. I have not had any squirrels attempt to master it so I can not comment on how it works regarding them. The birds love the feeder, but so did the squirrels! They couldn't get down witch's hat top, so attacked from below by jumping on the perches and gnawing them off. Sad birds! The manufacturer recently sent new perches, so we removed the old and inserted the new, then added a squirrel baffle to prevent attacks from the bottom (squirrels were climbing the shepherd's hook to get to it). All is well now! We especially like the capacity of the feeder - no more having to go in and out every few days. If the perches were made of metal rather than plastic, we wouldn't have had a problem. The only negative I have found is that the residue/shells need to be cleaned out of the 4 feeding holes so that whole sunflowers seeds can be reached. The birds went right to it, even though there were other feeders available. Love the design of the top - keeps water out!!! So far it's truly been squirrel proof and the birds are happily feeding. It's easy to fill and will be easy to clean when the time comes. In our climate, the hood should work well to protect from snow. Of the 4 feeders in my yard, this is the last one visited by my birds. They don't like the see trough roof, it seems confusing to them. We live on a windy hill, which makes that feeder swing all the time and birds don't like that very much. It is not the right feeder for me, I would not purchase it again.